From a technical perspective, I know this picture is not that great. I’m shooting with the sun in the left frame, creating that haziness. But it’s my favorite picture of the trip we took earlier this month on the Carnival Vista. We set sail just four days after my 40th birthday, and it was the perfect break from the craziness of work, holiday prep and life in general. The four of us as well as my mom, Eric’s mom, my great aunt and a family friend had been planning and paying for this trip for at least a year and a half. One day it was so very far away, and the next we were boarding the ship, ready for our five-day vacation along the Eastern Carribean. With stops at Amber Cove and Grand Turk, and two days at sea, we were ready for some family fun and relaxation. It has been five years since our last cruise (almost exactly, we traveled in mid-November of 2011), also with Carnival, and there are a couple of little changes we noticed, even with this ship, the newest in the fleet. No more little chocolates left by the room steward when they prep your room for the night. I loved those things, I’d hoard them and beg for more! They also no longer offer lobster tail or filet mignon during the formal night dinner as part of the standard menu. They are, however, available any day for an additional cost of $20. And the beautiful glass elevators in the Atrium are gone, at least on this ship (the sister ship Carnival Breeze does have the glass elevators). There were definitely a few things we loved about the ship though. Eric and Brandon rode the Sky Ride, which was really cool! At one point they were suspended over the ocean on a bicycle-looking contraption. (Matty and I did not get to ride it: He did not meet the height requirement, and I tried riding during the last day at sea, but the wait was about an hour and a half long). Carnival Waterworks was a family favorite. 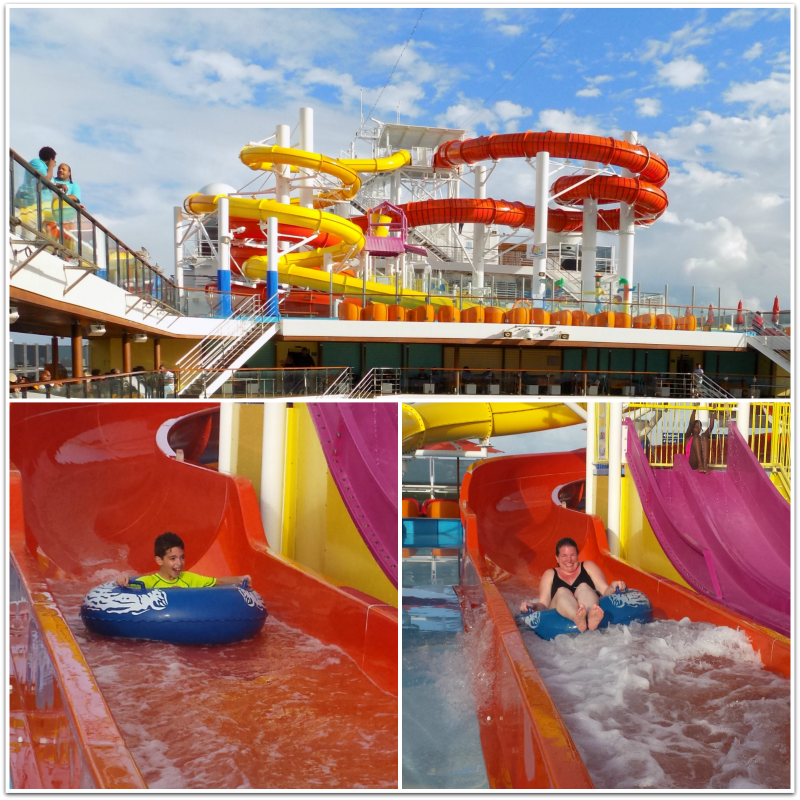 The huge water play area for the young and young at heart includes two waterslides: the Kaleid-O-Slide, and Twister. All four of us had a blast going through the waterslides over and over. The decor throughout the ship is beautiful! My favorite was the Havana Bar, inspired of course by Cuba. Since our travels took place just two weeks prior to Christmas, the ship was decked out in it’s holiday best, and included a visit from Santa himself! And last but not least, Matt Mitcham made our trip all the more enjoyable with his jokes and antics: we had the best Cruise Director ever! Overall, we had an excellent time, and it was nice to get away for a while with our family! And it was great visiting ports of call we’d never been to before. We’re definitely looking forward to planning another family vacation in the future. This entry was posted in Family & Friends, Travel. Bookmark the permalink.